“The guys who jumped in will never fight here again,” he said at the post-fight press conference. However, his position could change given Nurmagomedov’s ultimatum. “I would like to address the UFC,” Nurmagomedov wrote on Instagram. “Why didn't you fire anyone when their team attacked the bus and injured a couple of people? They could have killed someone there, why no one says anything about insulting my homeland, religion, nation, family? “In any case, punish me, Zubaira Tukhugov has nothing to do with that. “If you think that I’ll keep silent then you are mistaken. You cancelled Zubaira’s fight and you want to dismiss him just because he hit Conor. But don’t forget that it was Conor who had hit my brother FIRST, just check the video. “If you decide to fire him, you should know that you’ll lose me too. We never give up on our brothers in Russia and I will go to the end for my Brother. If you still decide to fire him, don’t forget to send me my broken contract, otherwise I'll break it myself. 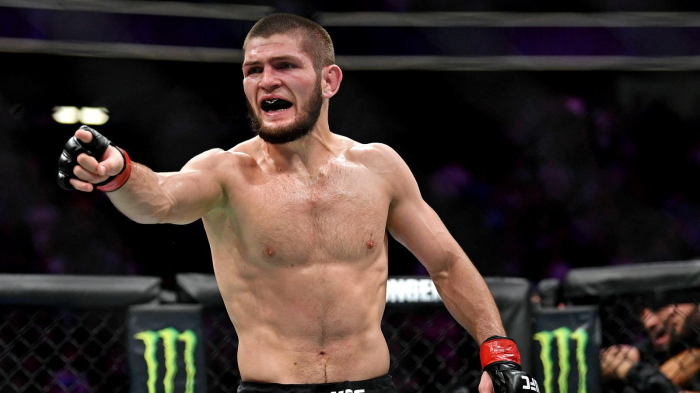 Nurmagomedov’s statement also appeared to confirm that Tukhugov’s forthcoming bout with Artem Lobov – a team mate of McGregor’s – has been officially cancelled.